Introducing Brand New Products + Be The First To Try Them! 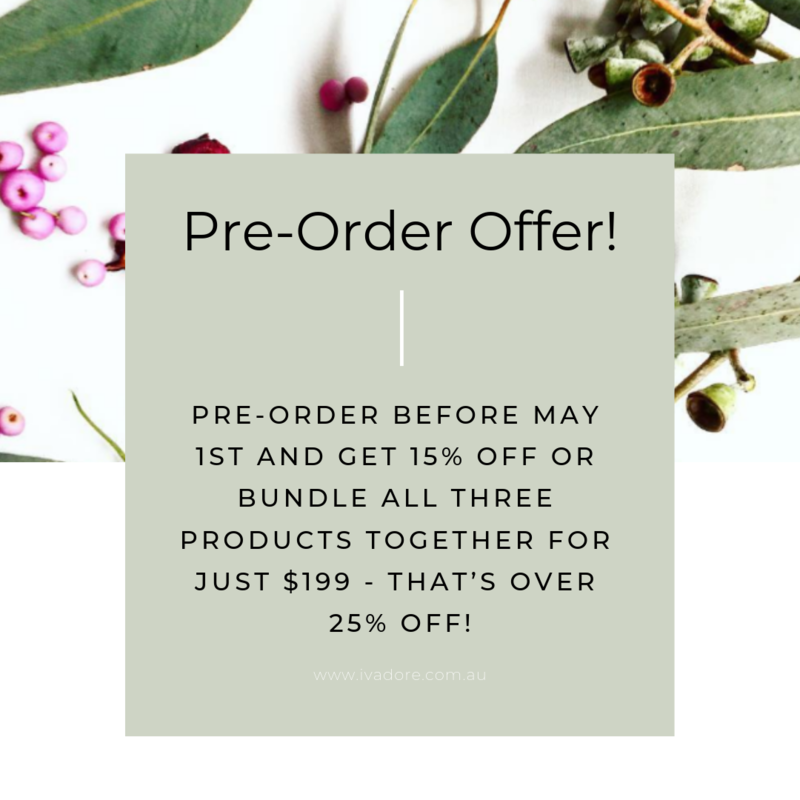 Pre-Order Before May 1st And Get 15% Off Or Bundle All Three Products together for just $199 - That’s Over 25% Off! We are extremely excited to announce three new additions to our skincare range! Our Founder, Tanya Felli, has been working really hard, researching the best new natural ingredients, rare gems from right here in Australia, where some of nature’s best skincare ingredients grow naturally. We’re proud to be Australian owned and made, but now we’ve got plenty of new native ingredients for you to discover as well. Before we jump into the juicy ingredients and their benefits for your complexion let us tell you about a very special little pre-order offer we’ve got for you so you can be the first to experience the latest cutting-edge skincare products, crafted with nature and a passion for bringing the very best ingredients into your daily routine. So here we go…The newest skincare on the block is! Now let us tell you why you need these skincare solutions in your life. Let’s start with a special Australian ingredient that you will find in all three of our new products! We all know that Aloe Vera is great for soothing and healing sunburn, but now you can experience this special native ingredient’s benefits everyday! So apart from smothering ourselves in it after a deeply regretted day of too much sun, why is this ingredient so amazing? We’ve used it as a base ingredient, instead of water, because it contains 20 of the 22 amino acids needed for the body. Its special hydrating properties increase collagen production and are great for skin pigmentation and (no surprise here) wound healing. Aloe Vera also penetrates the skin four times faster than water assisting other bio active anti-ageing ingredients, such as B vitamins, minerals, amino acids, polysaccharides and enzymes to work more effectively. Not sure if our NEW products are right for your skin? We now have sample sizes available online for you to try plus for a limited time only we are giving away one FREE sample of choice with all orders over $50 or get all three sample sizes for FREE with orders over $120! So that’s what is at the core of all our new skincare products, but what else will make these your favourite new skincare products? Jojoba Oil is another locally sourced ingredient that we’re proud to bring to your skincare regime because it is great for dry, oily and problematic skin as it doesn’t clog the skin’s pores. Jojoba oil is rich in iodine, which is shown to tackle harmful bacteria and this oil also helps to minimise acne due to its anti-inflammatory and antibacterial effects. Jojoba is also a potent antioxidant, which keeps the free radicals at bay that cause fine lines and wrinkles. The perfect protector for your face all day long! Lily Pilly is an ingredient we are so excited to introduce to our range. It is one of the top four Australian Indigenous Super Fruits, it contains high levels of vitamins, antioxidants, minerals, fruit acids, phytosterols and essential fatty acids which naturally enrich, moisturise and protect the skin. This super food berry also contains Vitamin C and fruit acids that make it an excellent promoter of the production of collagen. Our Founder, Tanya Felli, says, I created our Arise and Shine Antioxidant Day Cream to be your skincare best friend everyday. It’s the ideal product to start your day with for protection and active care throughout the day and with all the toxins in our surroundings today we need it more than ever! ivadore's Illuminate Brightening Facial Gel with Australian Snake Vine & Snowflower Extract is a light gel that can be used daily to combat uneven skin tone and is especially great as an eye serum applied at night to help eliminate dark circles under the eyes. The Snake Vine plant is native to Australia and has dark green leaves with fine yellow flowers, it’s one of those natural gems we were talking about because it provides an impressive amount of antioxidant compounds, in fact it’s so impressive it’s 100 times more potent than Vitamin C.
Snake Vine is also an excellent wound healer and it smooths the skin, reducing the signs of ageing. This is another wonderful native plant-based extract that helps reduces pigmentation and has strong anti-inflammatory actions as well as an abundance of Vitamin C that makes Snowflower Seed work wonders at targeting age spots and pigmentation. Kaempferol, a flavonoid glycoside present in Snowflower Extract also provides depigmentation and anti-inflammatory properties. Our Founder, Tanya Felli, says, The Illuminate Brightening Facial Gel gave me the opportunity to introduce some really special native ingredients to our range that I have had my eye on for a while. I also know our loyal customers really wanted something that would actively work on improving wrinkles and dark circles in the eye area so creating this versatile facial gel that can be used morning and/or evening to keep your complexion and your eyes glowing was a no brainer. I hope you all love it! Hemp Oil is perhaps one of the most exciting additions to our range of powerful natural ingredients. There is no shortage of hype about Hemp, especially since it became legal for consumption in food in 2017, but our Founder, Tanya Felli, has been studying its nutrient makeup for the skin for a while! So what’s the low down on Hemp Seed Oil & our skin? Tanya says, - “Our skin requires a unique balance of essential fatty acids to create healthy cells and no other plant source contains these essential fatty acids in such a perfect ratio for skin health as Hemp Seed Oil. It contains all of the 21 known amino acids, the building blocks of protein which is essential to ageing healthily as well as helping our skin to repair itself. Kakadu Plum is another incredible native ingredient with the highest recorded levels of natural Vitamin C content in the world. Vitamin C is essential for glowing skin; it firms skin, helps fade dark spots and scarring and is an essential nutrient responsible for the amino acid that is required to make collagen. It is found exclusively in the Northern Territory Arnhem Land and we are extremely proud to introduce it to the ivadore range. So there you have it, three new products, a whole bunch of amazing new natural and Australian ingredients + oils and extracts handpicked from our current range to bolster the formulas of each new product for the best results no matter which combination of our products you decide to use!